WASHINGTON — The last time Sen. Bernie Sanders introduced a bill to put every American in the government-run Medicare system, exactly zero of his colleagues supported him. When the Vermont independent did it again Wednesday, he turned a Senate hearing room into a premonition of a 2020 presidential primary debate as some of the party’s biggest stars lined up to declare their support for an idea that has moved from the fringe to the mainstream with stunning speed. Sanders announced that 17 Senate Democrats — a third of the caucus — had signed on to his bill, joining a majority of their colleagues in the House, who have already backed a similar bill. 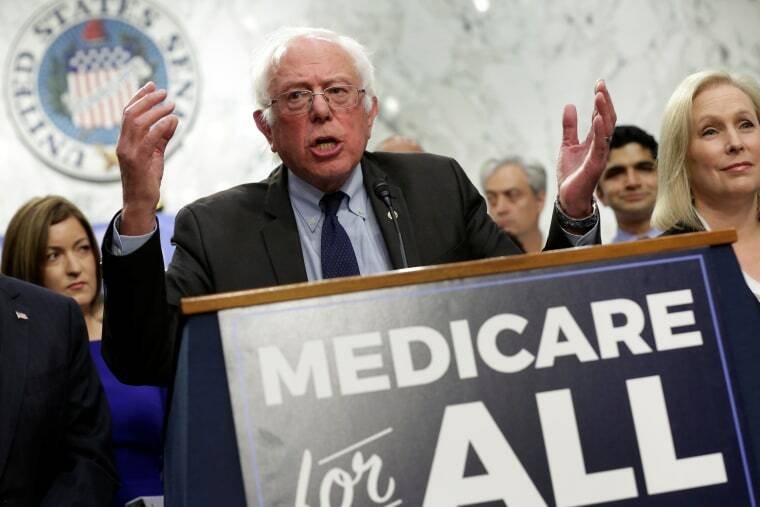 On Wednesday, Sanders said, “I have no doubt, none whatsoever, that this nation, sooner than people believe, will pass a Medicare for all, single-payer system." He was surrounded by multiple top-tier 2020 contenders. Sen. Kirsten Gillibrand, D-N.Y., hovered inches from Sanders’ left shoulder while Sen. Cory Booker, D-N.J., stood directly behind him. Sens. Kamala Harris, D-Calif., and Elizabeth Warren, D-Mass., flanked Sanders, a once and potentially future presidential candidate himself. “What’s important about this day is that you have a diverse collection of United States Senators speaking with one voice,” said Booker. Booker was a loyal supporter in last year's presidential primary of Hillary Clinton, who mocked Sanders' policy ideas in her new book as giving every American a pony. Still, the party’s official leadership has remained noncommittal. Moderates have kept their distance. Passing anything is impossible as long as Republicans control Washington. And the policy challenges — especially how to pay for such a giant program — remain prohibitive, as Clinton argued. But all signs point to the issue moving in only one direction in the party, thanks to an emboldened base and political cover from mainstream figures like the billionaire Warren Buffett and former Senator Max Baucus, who recently reversed course after keeping single-payer out of the debate of the Affordable Care act. Nonetheless, it’s a major political gamble on an untested policy, and one that could have collateral damage for Democrats in red states. “This plan forces every Democratic candidate on the ballot in 2018 to state their position on single-payer health care and whether they support the massive tax increases and total government control that comes with it,” said Jesse Hunt, a spokesman for the National Republican Congressional Committee. Only one Democrat up for re-election next year in a state won by President Donald Trump endorsed the plan, Sen. Sherrod Brown, a reliable liberal facing a tough re-election fight in Ohio who was notably absent from the stage Wednesday. Polling paints a mixed picture, with Americans increasingly predisposed to the idea of single-payer health care, but also open to arguments that it would raise taxes and give the government too much control. Medicare for all would represent an unprecedented disruption in the U.S. health care system, and an expensive one. Sanders has laid out a few ideas on how to pay for it, but critics, even those on the left, say they are overly rosy. Still, the point, advocates say, is not to pass this specific legislation tomorrow, but to start the conversation on an idea that could be taken in many different directions. Adam Green, a co-founder of the Progressive Change Campaign Committee, compared the event to “a product launch,” with "Medicare for All" more of a brand at this point than a specific bill. In public and private negotiations, Sanders has given his colleagues leeway, insisting it's not a "litmus test" for him no matter what his allies outside say. Sanders is better known for operating as a lone wolf, but he brought 19 other Senate offices into a working group to solicit input and earned goodwill by holding rallies to defend the Affordable Care Act and giving colleagues a pass to abstain on a single-payer amendment Republicans put on the floor to try to jam Democrats.